Let’s just get this day over with, ok? Oh……. the noise…… the noise. My ears cannot survive the noise. That little witch? That’s me circa 1975. No actual powers, dang it. The banner picture shows just older siblings. 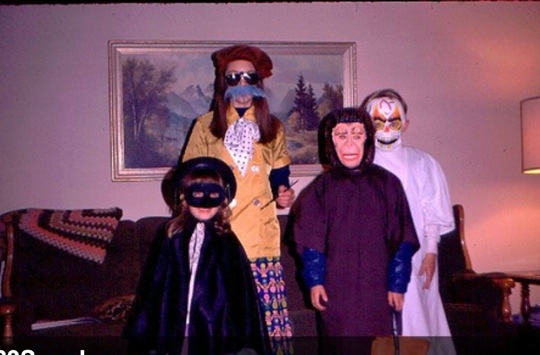 Ahhhhh….. Halloween as a child is the best. I bet I drove my teachers nuts with noise, too. I was a witch when I was in 2nd grade. I remember it was really cold & my mom had me so overloaded in clothes under my costume (I think I even had on snow pants) that I had a really hard time getting up all the steps to each house. I hope you have a surprisingly quiet day. Maybe next year you could tell them they all have to dress up as Harpo Marx. Those hard plastic masks! I had a Casper the Friendly Ghost one I think. But mostly we just got stuff from the costume box in the attic. Our parents went to a lot of costume parties before we were born. Hey Lauren -- wanted to tell you that I replicated Lloyd’s RTA costume from a couple of years ago for my husband to wear to work. Thanks for the inspiration! Sadly he didn’t win the prize, which went to someone who greened-up as The Hulk. Totally unimaginative, but there you go (says she who stole someone else’s idea). Ribs!! So good to hear from you!! 😀 Hooray! !